Obituary – Lewellen, Marie (Leighan) « Perry High School Alumni Association, Inc.
Funeral will be at 2 p.m. Monday at the First United Methodist church chapel in Perry for Clarice Marie (Leighon) Thompson Lewellen, 93, who died Tuesday, July 11, 1995, at a nursing home in the Los Angeles area of California. Lyle Thompson, Fayetteville, AK, a nephew of the deceased, will officiate. Burial will be in the Grace Hill cemetery under direction of Brown Funeral home of Perry. Mrs. Lewellen formerly resided in the Perry community. She was born in Valley Falls, KS on July 21, 1901. She was married to Fay Thompson on May 24, 1929. 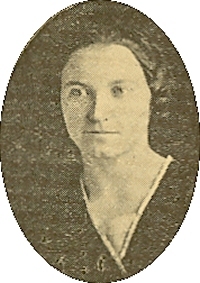 Thompson preceded his wife in death. She and Elmer Lewellen were married in 1965. He also preceded his wife in death. Among survivors are two daughters, Mary Helen Schreiber, Carlsbad, CA, and Leora Thompson Conditt, Fort Worth, TX; seven grandchildren, Paul Thompson Schreiber, Matthew Scott Schreiber, Eric Linden Eppler, Chris Alan Eppler, Kyle Thomas Eppler, Clay Michael Eppler, and Anne Marie Finley; seven great-grandchildren, Nichole Marie Schreiber, Megan Elizabeth Schreiber, Emily Page Eppler, Catherine Diane Eppler, Benjamin Alan Eppler, Kate Anne Eppler and Kyle Jacob Holiday; one sister, Viola Smith, Greely, CO; and Curtis Leighon, Cheyenne, WY.